Tenaxit tablet: Each tablet contains flupentixol dihydrochloride INN equivalent to 0.5 mg flupentixol and melitracen hydrochloride INN equivalent to 10 mg melitracen. 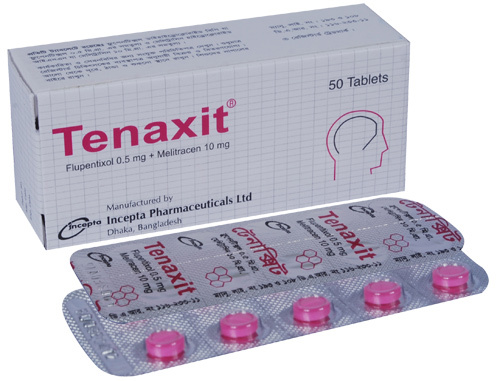 Tenaxit consists of two well known and well proven compounds: flupentixol- a neuroleptic with anxiolytic and antidepressant properties of its own when given in small doses, and melitracen - a bipolar thymoleptic with activating properties in low doses. In combination the compounds render a preparation with antidepressant, anxiolytic and activating properties. Maximal serum concentration is reached in about 4 hours after oral administration of flupentixol and in about 4 hours after oral administration of melitracen. The biological half-life of flupentixol is about 35 hours and that of melitracen is about 19 hours. The combination of flupentixol and melitracen does not seem to influence the pharmacokinetic properties of the individual compounds. Maintenance dose: Usually 1 tablet in the morning. In cases of insomnia or severe restlessness additional treatment with sedative in the acute phase is recommended. In the recommended doses side-effects are rare. These could be transient restlessness and insomnia. If previously the patient has been treated with tranquilizers with sedative effect these should be withdrawn gradually.